Have you ever tried this spicy dish called Agu jjim (아구찜)? My friend Hannah at Songjin Agu Tang restaurant in Inchon, South Korea. Agu jjim is a specialty of Masan, South Korea in Gyeongsangnam Province (경상남도), just outside of Busan. I actually ate this dish in Incheon, though, at Songjin Agu Tang restaurant (성진 아구탕 식당). And I learned that there are two streets in Seoul where restaurants specialize in agu jjim. There is one in Sinsadong (Gangnam) and one in Jongno (Dongdaemun area). The most interesting aspect of this dish is that such ugly sea creatures can be SOOOO delicious! The combination of monkfish (아귀, "agwi"), sea squirts (미더덕, "mee-doh-dok"), soybeans (콩나물, "kong namul"), sweet red peppers, and water cress (미나리 "minari") is a textural delight! 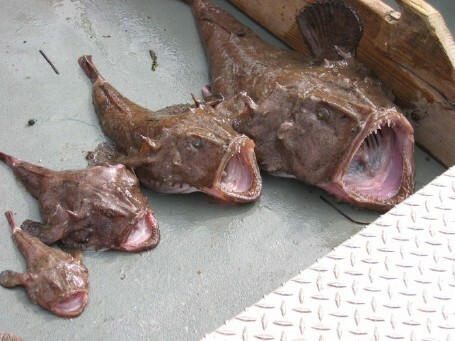 Monkfish is a tender, sweet, meaty fish that honestly tastes like lobster. Midodok, or sea squirts, are small and tubular. When you bite into midodok, it will *pop* and squirt a unique salty flavor that is really addicting! Bean sprouts, watercress, sweet red peppers, and ginger add freshness to the spicy red pepper paste (고추장, "geochujang") sauce. The dish is served on a giant platter and is especially popular as a nibble (안주 "anju") when drinking soju with friends. A clear soup with large slices of tofu, along with a dish of rice, accompany agu jjim. When you have eaten your fill, you can ask the waitress to make a stir fry of the leftovers, which you can take home to eat the next day. I found a few recipes in English, so please visit and thank: Korean Bapsang (replaces sea squirts with clams or shrimp) and Mannam Cooking (uses sea squirts). I think midodok 미더덕 is the best part of agu jjim, but it may not be to everyone's liking. These two recipes should satisfy either taste bud. I made agu jjim at home in the U.S. It was surprisingly easy to make, so give it a try!